On Friday evening the second Winter Exhibition by some of the artists on the Pittwater Artists Trail opened at Bilgola Surf Life Saving Club at the southern end of Bilgola beach. MC for the evening, Narrabeen fine art photographer Cade Turner, explained the two fold focus of this exhibition as a means for artists on the Pittwater Artist Trail, where people usually visit the wide range of artists in all mediums in their home studios, to exhibit together under the one roof. The Winter Exhibition is also a way for Pitwtater Artists Trail creators to invest back into the community as 10% of all sales from art works sold during this weekend’s exhibition are donated to the Bilgola SLSC while a raffle running concurrently, with prizes of donated art works by these artists, raises funds for Mona Vale Hospital. In 2011 this exhibition attracted more then 1000 people through the doors which allowed us to raise a substantial amount of funding for the Bilgola SLSC for all of the essential services they provide to the local community. Thank you very much to the Bilgola SLSC for hosting our exhibition again this year and we’re pleased to announce that we’ll be donating 10% of all sales made this weekend to the Bilgola Surf Club. We’ll also be raising money for Mona Vale Hospital through an exhibition raffle. To open our exhibition this evening we are very fortunate to have and welcome cinema-photographer John Ogden. John, who also goes by the name ‘Oggie’ is a world-renowned photographer, cinema-photographer, writer and publisher. His wide ranging career has included producing television commercials, international documentary making, music video production, drama and fine art photography. John has worked all over the world, his projects spanning diverse cultures and nations such as South-East Asia, Sri Lanka, China, Japan, Europe, South America, the U.S.A. and indigenous Australia. His work in imagery associated with Australian Aborigines resulted in the books Australian Nation in 199 and Portraits From A Land Without People released in 2009 to coincide with the first anniversary of the Australian Prime Minister’s Kevin Rudd’s apology to the aboriginal people. Portraits From A Land Without People was captured from a four year period examining over 300 thousand images and is considered to be the most comprehensive pictorial history ever produced of the aboriginal people in Australia. Would you all please put your hands together for John Ogden. 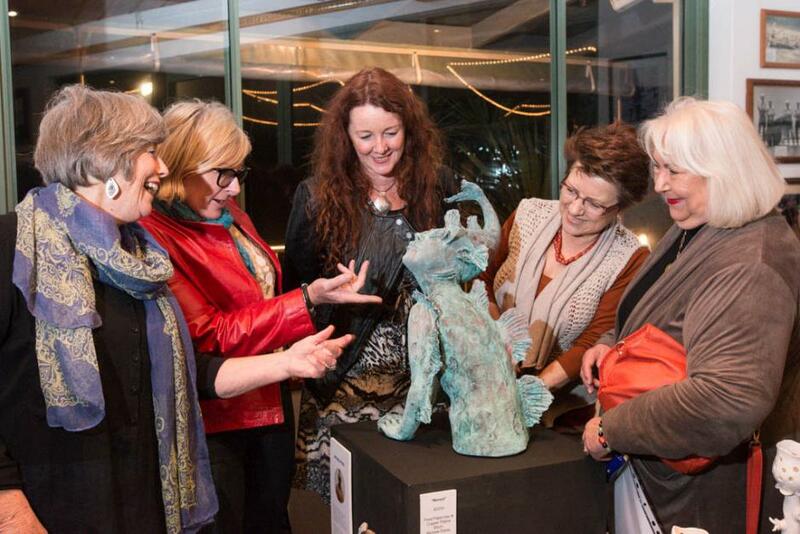 Welcome everyone to the Pittwater Artists Trail Winter Exhibition. Before I start I’d just like to acknowledge the Garigal clan of the Dharug Nation of this land on which we’ve gathered. This club was most likely built on one of their middens. It took the Europeans another 100 years after really interrupting the traditional ways of the life of Sydney’s Coastal Clans to appreciate the joys of getting your gear off and having a seafood barbecue on the beach. Life was arranged so well by the Gadigal that they only had to work a few hours of every day to have the food they needed. This left plenty of time for family and ceremony. It is said that the Australian Aborigines were the first people to combine song, dance and art, much like an early form of going to the theatre or cinema. If you look carefully you can still see some of their artwork on the terraces of Sydney Sandstone around this area and there are a lot more out there. In fact, sixteen thousand years ago, when the people were roaming around, they knew you had to walk another eight kilometres towards the sunrise to find the beach. It is therefore fitting that many of the people who moved to this area in the early twentieth century were artists. There was quite an artist’s colony here by the 1950’s. Early artists who came from the Northern Beaches or lived here; Sydney Long, Lawson Balfour, Arthur Murch, who won the 1949 Archibald Prize, Sali Herman OBE and he was the winner of the Wynne Prize in 1944, 1962, 1965 and 1967 as well as the Sulman Prize in 1946 and 1948. Master photographers from this area included Harold Cazneaux, Frank Hurley, Max Dupain, Olive Cotton and Dave Moore. Contemporary artists and photographers who call this place home are many and varied. Fast forward to tonight’s launch. 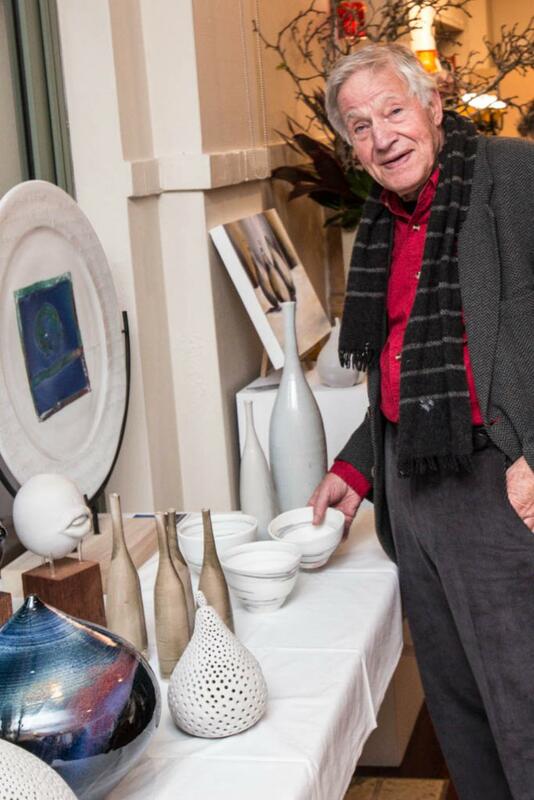 The Pittwater Artists Trail Winter Exhibition is a unique and popular event where Artists of the Pittwater Artists Trail come together under one roof to showcase some of their work. 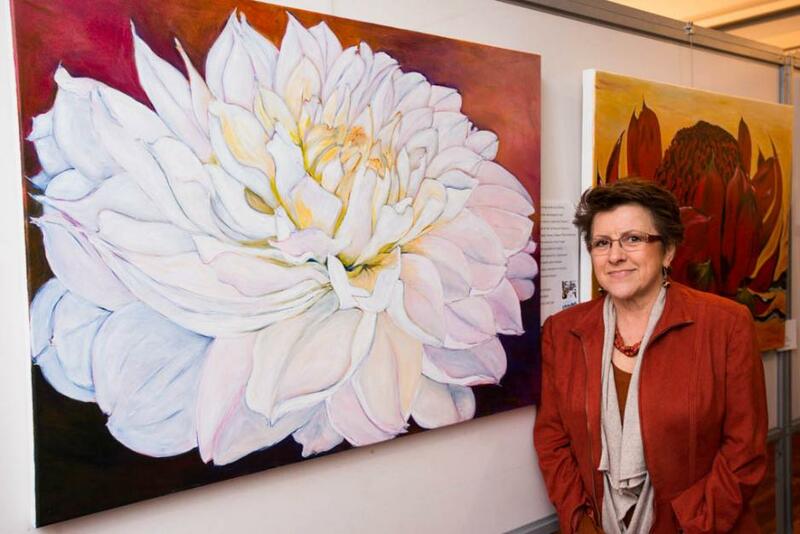 Over half of the Pittwater Artists Trail 2013 membership are exhibiting, including Penel Bigg, Diezel, Linda Haigh, Wendy Grainger, Karen Hick, Helen Mackay, Willi Michalski, Robyn Park, Mignon Parker, Michelle Petrie, Vicki Ratcliffe, Meredith Scott, and Cade Turner. Media here include fine at photography, print making, blown work glass, acrylic, water colour, oil, and mixed media painting. Mosaics, ceramics, painted silk, jewellery and sculpture and all of these works are for sale. This will be the Artists Trail second Winter Exhibition at the surf club with the first seeing over one thousand visitors despite roaring seas and howling rains. You may hera it in my voice; I am incredibly proud of the Northern Beaches community. I did a book called ‘Saltwater People of the Broken Bays’ on the local history and it enjoyed enormous support. I’m most grateful to this community. I’m sad to say that the recently released companion book on the south side beaches was less successful. One of the reasons for this is that the south side lacks the community spirit found here, on the beaches stretching from Manly to Palm Beach, the real sense of love and pride for this amazing place. The exhibition continues all weekend – Saturday and Sunday from 10am to 4pm and will be raising much needed funds for Mona Vale Hospital and Bilgola SLSC. Raffle tickets for Mona Vale Hospital will be on sale for donated art works by participating artists as prizes. Thank you once again for coming, please enjoy the exhibition. "After a long career as a florist, I have developed a real love for nature. 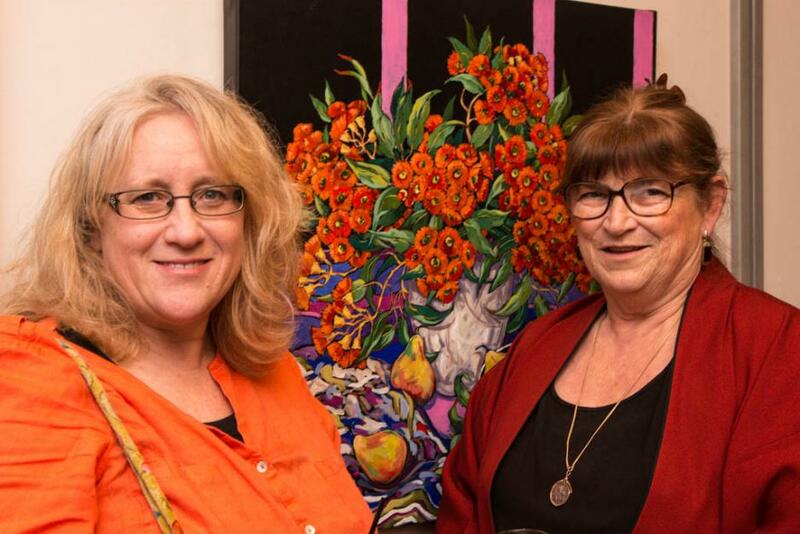 I marvel at the variety and beauty and the amazing colours" says artist Wendy Grainger, who also organised the Pittwater Artists Trail 2013 Winter Exhibition. 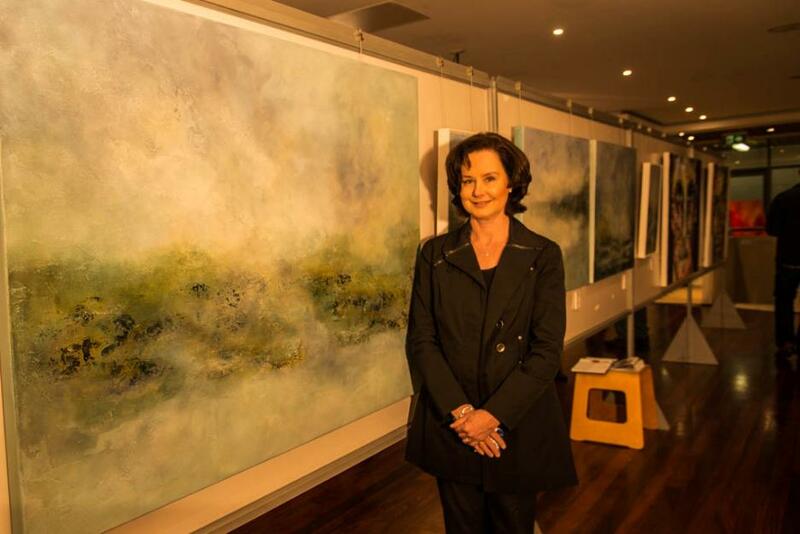 Karen Hick from Palm Beach with her abstract landscapes. John Ogden, Hon. 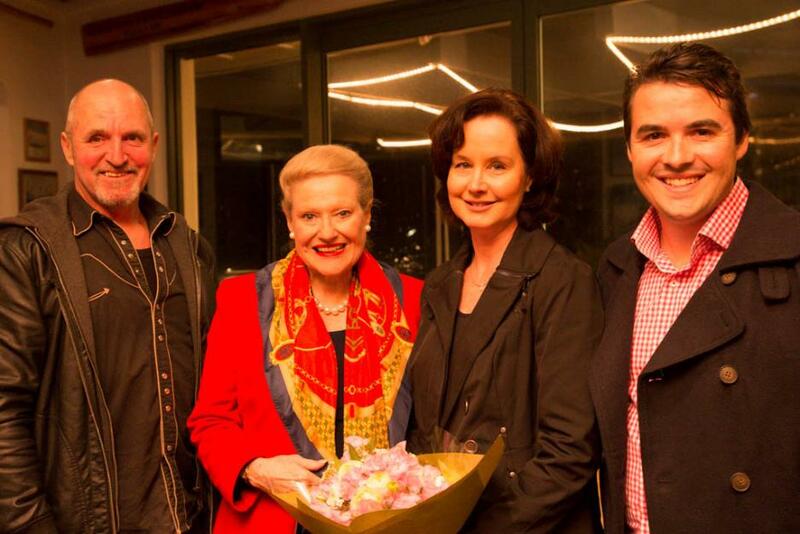 Bronwyn Bishop, Karen Hick and Cade Turner. Stephanie Brown with artist Mignon Parker. Mignon works with acrylic and mixed media and is conducting workshops locally and State wide. Willi Michalski from Church Point creates high fired stoneware and porcelain one off studio pieces. Report by A J Guesdon, photos by Michael Mannington, 2013.